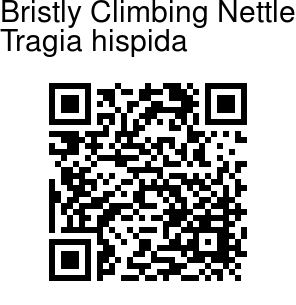 Bristly Climbing Nettle is a climber, up to 1 m long, trailing or twining, bristly with stinging hairs; young shoots densely bristly or hairy; branches scattered hairy. Leaves are lanceshaped to oblong-lanceshaped, heart-shaped or narrowly so at base, entire or with 2-3- teeth towards base or remotely sawtoothed or minutely toothed at the basal half along margins, narrowed to narrowed-with a tail at tip, 5-15 x 1-5 cm, membranous to papery, scattered appressed bristly above and beneath, 3-nerved at base; lateral nerves 4-8 per side above the basal, brochidodromous. Leaf-stalks are 5-20 mm long, densely hairy or bristly; stipules linear-lanceshaped, 3-5 mm long, falling off. Flowers are borne in racemes 5-18 cm long; flower-cluster-stalks 2-9 cm long; bracts linear, subulate or lanceshaped or ovate (in female), 2-3 mm long. Male flowers: flower-stalks 0.5-1 mm long; sepals nearly round, about 1.5 mm across; stamens 3; filaments about 0.3 mm long, united at base; anthers oblong to nearly round, about 0.4 mm long/across. Female flowers: nearly stalkless; sepals 6, 4-6 mm long, pinnate-fringed; ovary subspherical, about 2 mm in diameter, bristly; styles about 2.5 mm long. Fruits are nearly stalkless, depressed, deeply 3-lobed, 3-4 x 10-12 mm, scattered hairy or bristly; fruiting sepals 8-10 x 6-8 mm. 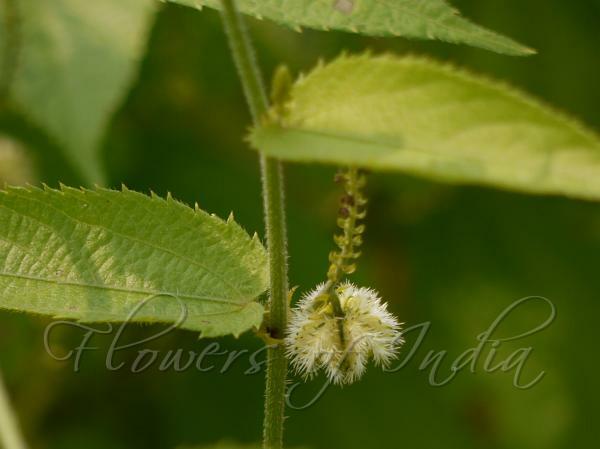 Bristly Climbing Nettle is found along thickets and scrubs, occasionally trailing on ground, iin Uttarakhand, Bihar, West Bengal, Assam, and Bangladesh. Flowering: August-October. Identification credit: Sadanand Gupta Photographed in Lonavala & Kas, Satara, Maharashtra.